The US Attorney’s Office in New York City issued a press release this afternoon announcing charges for the founders of three major online poker companies: PokerStars, Full Tilt Poker, and Absolute Poker. There are some serious charges in the indictment, and this could be a game changing moment for companies in the online poker business. According to the press release, the government seized five domain names, although it did not mention the domain names that were seized. Generally, there is a clear message posted on the website indicating the seizure, which you can see in the graphic above. Based on the message that currently appears on UltimateBet.com and also on UB.com, it appears that these domain name were two of the names seized, although the Whois information does not reflect that yet. According to a page on Wikipedia, Absolute Poker and Ultimate Bet are owned by the same company, Cereus Poker Network. It appears that the websites for Full Tilt Poker, Absolute Poker, and PokerStars are still operational right now, although I don’t have a list of domain names that these companies use for their businesses. This could be a game changer, since these are all major websites, and I don’t recall seizures of domain names for major poker companies like this. One of the most interesting things to follow will be learning how company clients will get their millions of dollars in deposits refunded. Thanks to Alexander Ripps at GamblingCompliance.com for the tip. Wow, this is huge news. I only skimmed the press release, but this will undoubtedly stay in the courts for a long time. Anyone else find that takedown notice on such domain looks very amateur? The seals are are low-res and the text is surrounding by a shocking amount of noise. These notices have never looked professional to me, I just wonder what other think. They look pretty damn scary to me! 3 billion in penalties + Interpol arrest warrants for those not arrested yet. Simply wow. UltimateBet.com forwards to UB.com and UB.com loads for me. Hmmm… The forward is the same for me, but UB.com shows the seized graphic for me. I also tried it with a proxy and it showed the same seized graphic. Wonder if it’s a DNS issue or caching. It looks like fultilt and pokerstars are also siezed. Those sites are loading correctly for me. I wonder if it’s a caching issue. Would have been nice if the press release listed the 5 names. Wow that was fast since they just legalized online gaming in DC. The Govt just put them on lockdown.Makes you wonder. I used a proxy server just now which shows PokerStars has the same message. Perhaps the DNS changes are propagating. Strange though. UIGEA- the federal law that regulates this- defers to the states per a 2009 court ruling. This means that internet gaming in Massachusetts will be regulated by Massachusetts. Obviously, the issue is being dissected down to the subatomic level on twoplustwo. Here’s the thread in NVG. Lets see what happens in future. FBI isn’t advertising their designing skills. I was using FTP as one of my affiliates and just took down all their links and banners. I find it interesting how the timing of this coincides with the DC legislation passing. In my estimation this could play out two ways,.. either the government is really cracking down on any and all forms of online gambling, meaning the DC legislation is doomed or they are starting to clean up outside unregulated companies in anticipation of taxing and regulating online gaming themselves. I hope it’s the latter, as I knew about the DC regulation days before it was known to the domain world and registered some pretty killer names. This is bad news for domainers. Ub.com loads fine for me. Even after flushing the DNS. @Elliot: have you tried flushing the dns? Speculation on my part…but I am quite sure we will find out soon enough. It’s the other way around… Pokerstars is (as best we know- the online poker industry is intensely clandestine and makes the domain industry look like a Boyscout Convention) mostly or wholly owned by Isai Scheinberg. Full Tilt Poker, otoh, has a lot of fragmentary interest from the high level poker world. Howard Lederer and Chris Ferguson were supposed to be the originators, with a lot of the ‘big name pros’ being allowed to invest early and were given ownership stakes in return. If you want an idea of the players involved, see those named in the now dismissed Clonie Gowen lawsuit. “Nearly a dozen people connected to international gaming sites PokerStars, Full Tilt Poker and Absolute Poker were charged with bank fraud, money laundering and illegal gambling – and their companies face over $3 billion in penalties and forfeitures, authorities said. “Full Tilt Poker” is the site I was thinking about… do not know why I put “poker stars”. The reason I mentioned it is…because of all the things you mention about “Full Tilt Poker” in your post. Thanks again for correcting my mistake. This could turn out to be a very favorable thing for some domain investors and those just getting their feet wet in the online gaming world. It’s interesting, however it shakes out… Will be very interesting to see how they handle the well known spokespeople with share interests. Doyle Brunson in Doyles Room, the FTP crew. Much like cheating in online poker (that everyone had their heads in the sand about until it finally came to light), there have been people screaming about the gray area status of online poker for quite a while. I made posts on 2+2 immediately following the Safe Port Act warning of this or something like it, but was shouted down by all the ‘experts’ and theorists. Chalk this up in that category of things that the hive didn’t believe would ever happen, until it did. Unfortunately, it screws everyone who enjoyed playing online poker, myself included. This is why I never let my online roll get above ($X) before cashing down. Interesting. Registrant and registrar appear to be in the UK. How does the US seize “property” in the UK? Were they seized at the registry level? The irony being that this is exactly why the U.S. needs to legalize and regulate it (online gaming.) Not only to collect the revenue they desperately need and are loosing out on, but most importantly to protect consumers from unregulated casinos and their shady operations that potentially could shut down on a moments notice (for whatever reason) taking their players money. Casinos..both land-based & riverboat sould get a boost in business and activity near term as a result of this uber severe crackdown… as some folks will not be able or wanting to cease their poker/gambling hobby, addictions, competitive juices, entertainment..or penchant for action… Casino moguls Steve Wynn & Donald Trump & Gary Loveman might be feeing extra good tonight. This in the end could be very good for online poker. It will force the DOJ to go to trail and settle once and for all if online poker is illegal or not. And by recent rulings in other courts it looks very good for the poker sites. 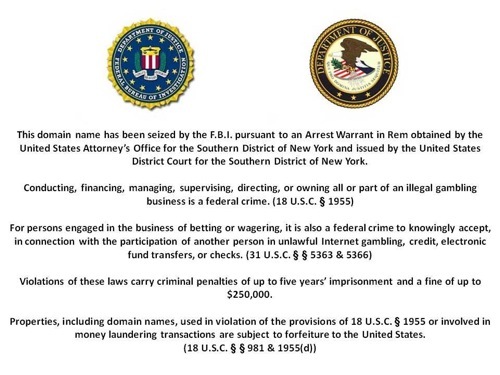 US-based people gambling online – at sites whose domains are UK registered, with UK registrants….But, the FBI thinks they can seize the domains?!? Wtf. Does the FBI really think they can seize the domains of ANY online business (that may be registered and run from outside the US) because some US citizens use that site?? ?….The US authorities are kidding, right??? Pull your head in, America…! !…Sanction any US-based INDIVIDUAL that uses a site to do business that is illegal in the US – but, hands off the domains, themselves, of businesses that are owned & operated in NON-US jurisdictions. 98% of the world out there is NOT US territory!! A Third Circuit ruling in 2009 determined that what constitutes “unlawful gaming” as stated in the UIGEA is predicated on the states definition of same, thus creating a bizarre nexus between state law and federal enforcement authority. The issue isn’t in need of defining. It’s clear. The .com registry is US based and will probably bow down to a US court order pretty quickly. To my knowledge, the finer points of this matter haven’t been broken down and made public (as far as how they went about seizing the domains), but as we saw with Wikileaks and now with online poker, if you’re going to dabble in eGray-Areas that piss off US politicians, doing so on a .com, .net or .org probably isn’t such a good idea. This has to be one of the most extraordinary events since the history of the web itself! It’s also proving the dictatorship position the US government has taken towards the democracy of the web. What I do not understand how come US has jurisdiction outside of USA and can seize domains and property, only because founders of the company are US citizens? All those companies are established outside of USA. Makes no sense at all. The charges are very serious and it seems like a lot of crap to me. BoDog.com accepts U.S. players and operates one of the biggest online casinos/poker rooms but still hasn’t had it’s domain seized.Granted, Apparently it is licensed at at Indian reservation in Canada. They did one smart thing, their non U.S. assets bodog.co.uk and others operate independently under seperate licenses, hence, the U.S. cannot disrupt their entire franchise, just the .com based one. Yes, they were actually one of the first to have their domain taken away. They got it back. Yes, it seems you’re right…This is appalling!! …The US Govt does NOT have the right, imo, to unilaterally seize .com domains just because they are currently managed by a US organisation. If this is allowed to stand, then, overnight shutdown could happen to ANY online business using .Com, .Net, .Org domains – or, ANY domain that has its Registry managed in the US – REGARDLESS which country the business, itself, is registered in… Or, where in the world the owners of the business reside. I could run a business on a .Com domain that is perfectly legal in, say, the UK and Europe, and, Australia – but which is illegal in the US – and, because US-based people transact with me, the US Govt thinks it can grab my .Com domain & kill my perfectly legal (global) business overnight!!! Otherwise innocent business could also be killed by this high-handed, aggressive, overbearing attitude….The US needs to remember it does not own the world! This action must be overturned!! The implications are too horrific to contemplate. This is not about democracy of the web, it’s about money. The IRS is the agency behind the shutdown. They weren’t going to sit and watch all the tax revenue disappearing without getting a piece of the cake. Poker is not gambling.If poker is gambling then so is online stock trading or trading in general.Why do the same people keep ending up at final tables,time and time again?What are they the luckiest people in the world?NO!In the game of poker you measure the equity involved in any given situation based on all of the available information you have at your disposal and act accordingly.Just as investments in the stock market do not always yield the returns expected or not at all in many cases, poker to has this trait.Now, you may say, what about the people who do not know how to play and are blowing their money gambling.Well to you I say, ANYONE who invest in anything in life without calculating the risk to reward ratio properly and accounting for all the variables at their disposal is GAMBLING.In that sense poker is gambling and so is everything else you do.What about children who dream of becoming pro football players?Should we tell them that they are not aloud to gamble with their physical well being or for that matter what about the cost of playing football that is spent and more times then not wasted because of an injury down the line or lack of discipline and fading interest.Adults should be able to measure risk by themselves and they do not need the help of the government.Now if you are talking about slot machines then yes I agree get rid of them as they are BUILT to make the player lose or how about state lotteries?Poker is a game of 100% skill.If you invest in the correct situation you WILL make money playing against weaker opponents.This is no different than any other sport!I did not see any of you stepping in to save Buster Douglas from Mike Tyson when the odds were 50 to 1.NO!You didn’t because you believed it was the mans right to wager his body against the will of another man.I hope this has opened the eyes of some.Thank you for taking the time to read this, regardless of what your opinion is.Remember it is your duty to protect the freedoms of others as one day your number may be called and will I be there to stand for you if you will not for me? When are they going to realize there actions will one day cause a second revolutionary war? Good for them!! those website are (many times) a way to “relocate money” easily across the globe..